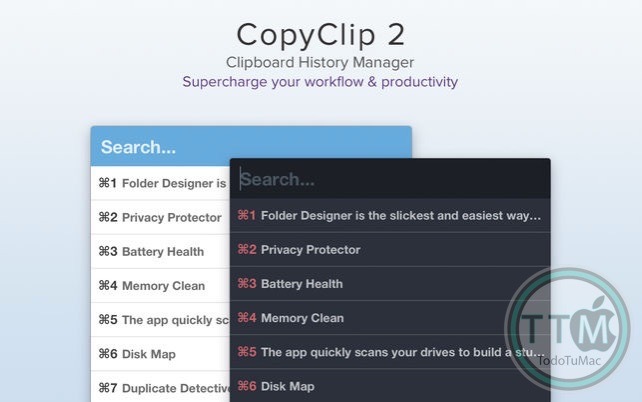 CopyClip 2 is the slickest and most efficient premium clipboard manager for your Mac. 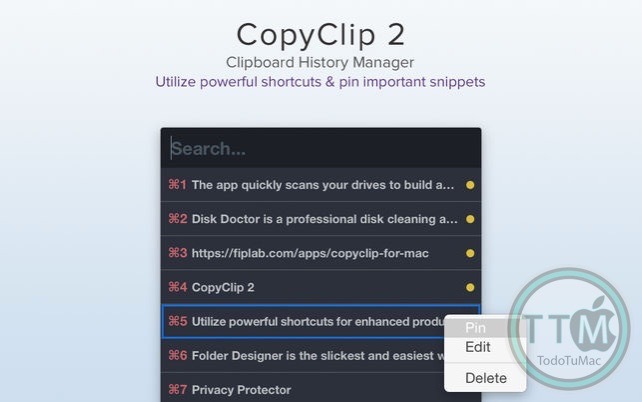 Running discreetly from your menu bar, the app stores all text that you have copied or cut in the past, allowing you to quickly find that snippet of text you've been looking for. • Ability to store up to 9999 clippings. • Option to paste clippings with the original formatting if desired. • Ability to search through clippings using the embedded search bar. 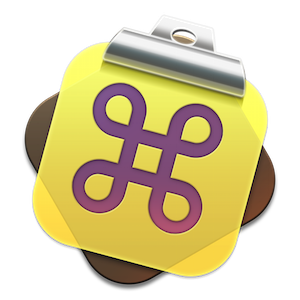 • Keyboard shortcuts to paste clippings. • Right-click option to ‘pin’ chosen clippings to the top of the list. • You can exclude apps you wish not to copy clippings from. 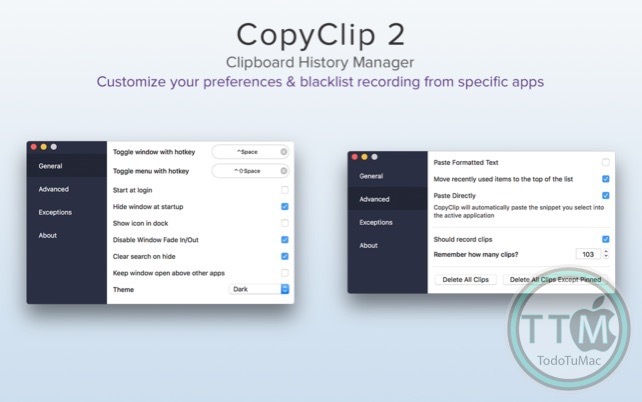 • Option to edit and delete individual clippings, as well as delete all clippings at once. • Toggle between Dark/Light user interface themes. • Works on both the menubar and the Dock. • Improves your overall productivity, speed and efficiency. 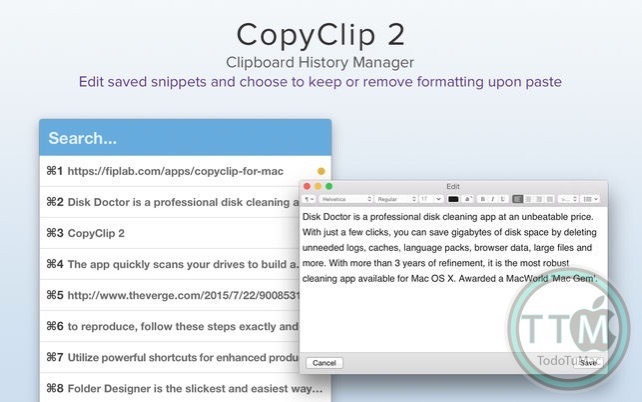 • Saves you time on the mundane task of cutting/copying/pasting. 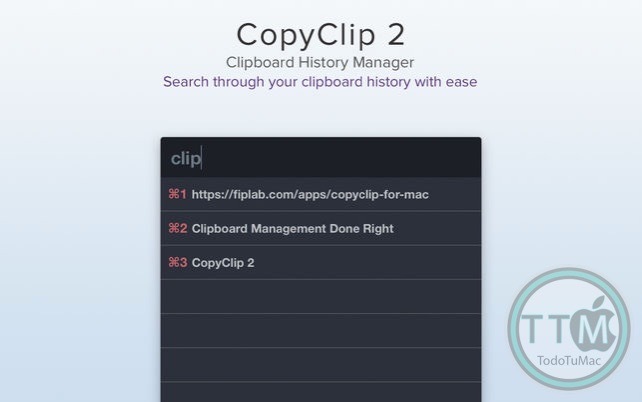 • All your recent copied items are stored on the app’s clipboard = less worries! • Pinning items to the top of the list keeps those important clippings within easy reach. • The search bar helps to ensure anything you may have previously copied, is easy to find again.